A Beehive as it appears in Super Smash Bros. for Wii U. The Beehive (ハチの巣, Beehive) is an item from the Animal Crossing series in Super Smash Bros. 4 and Super Smash Bros. Ultimate. It functions as a throwable item that unleashes a swarm to deal continuous damage to a target, similarly to the Cucco item. A beehive in Animal Crossing: New Leaf. The beehive item originates from the Animal Crossing games, and it is present in every installment of the series. Beehives occasionally fall out of oak and cedar trees when shaken. When one falls out, it hits the ground and a swarm of bees chase the Villager. If the Villager does not quickly go inside a building or catch a bee with a net, he or she gets stung, and given a swollen eye that must either be treated with medicine or heals on its own when the player quits the game and starts again. It wasn't until New Leaf that the player was able to pick up a beehive afterwards, as they simply disappeared in previous installments. Coincidentally, beehives also exist in the Legend of Zelda series, with similar behaviour. Donkey Kong being stung by bees. 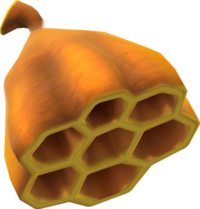 The beehive is an item that can be attacked, or picked up and thrown. Upon being hit, or being thrown and hitting an opponent or terrain, a swarm of bees will emerge from it which will target a single player, following them around the stage; the beehive itself disappears after the bees emerge. The target of the bees depends on how the beehive was activated. If a thrown beehive hits an opponent, that opponent will be the target. If it hits terrain, the target will be the opponent nearest to the beehive. If the beehive itself was attacked, the target will be the attacker of the beehive. If there is no opponent present, the bees from a thrown beehive will immediately disappear. The swarm attacks approximately every two seconds, dealing 2-4% damage and causing flinching. The bees will remain active for 10 seconds chasing their target, and cannot be reflected, shielded against or destroyed, with the exception of item-swallowing (though only if they are eaten before their first attack). The bees' attacks can be dodged with a roll, sidestep or airdodge. While often simply a nuisance, the low hitstun caused by the bees can interrupt attacks and movement options of the victim, making them easier to hit. However, this can be beneficial to recovery, as the bees' attacks can flinch the player out of helplessness repeatedly; a notable example comes from Little Mac, who can repeatedly use Rising Uppercut and significantly improve his recovery. Rarely, due to a bug, a Beehive may break without any interaction from players. Note that all throw damages are immediately followed by 3% damage from the bees as they fly out of the beehive. The Beehive trophy appears in both versions. In Super Smash Bros. for Wii U it is part of the Animal Crossing: New Leaf Trophy Box. An example of fine architecture constructed by insects, these bees are not shy about defending their hard work. Throw this at an enemy to direct their hate at that player. If the bees are after you, you can shake them for a while with some evasive maneuvers, but they'll track you down. Bees don't like it when people destroy their home, so if you break a beehive, they'll come out looking for revenge. Even if you innocently had the beehive thrown at you, you'll be the target. You can dodge all you want, but they'll probably get you in the end, and their stings'll do a LOT of damage. Villager holding a beehive in Super Smash Bros. for Wii U.
Wario is afflicted by bees flung by Peach. An individual screenshot of the Beehive. The bees from this item are rendered as 2D sprites. The bees will change size according to whether their current target is affected by size-altering items such as the Super Mushroom, Poison Mushroom or Lightning Bolt. Hitting a normal-sized target reverts the bees to normal size. This page was last edited on November 21, 2018, at 21:42.